Is “unity of science” a form of metaphysics? Eli Hirsch, in his paper in the Metametaphysics book, says he wants to conjoin a “Carnapian” approach to ontological questions with a “robust realism” (p. 231) and a defense of common sense, which, he claims, “doesn’t seem to be a concern for Carnap” (p. 232). Actually, it was a constant concern of Carnap through all stages of his career. He saw a continuity, rather than a sharp break, between common sense and science (Schilpp volume, p. 934). But he also saw them as playing fundamentally different roles; he saw an increasing gap, since perhaps Newton (or Archimedes), between the ordinary language in which we live and act and the technical languages (to which alone sentences could be “internal”) we depend on for knowledge. He thought it simply unfeasible — a kind of category mistake (Huw Price considers the parallel to Ryle) — to rely on the former kind of language in the latter context. Only the continuing general ignorance about Carnap makes it possible for people to get away with this sort of thing. Would anyone take you seriously if you said you wanted to combine a Kantian approach to ontological questions with a robust realism and a defense of common sense? Or Frege’s approach to arithmetic with Mill’s? But apparently you can still say almost anything you like about Carnap and no one will call you out on it. More examples to come. The whole memoir is worth reading, if only to see how venerated Carnap could be by a philosopher who was really on a completely different wavelength. One begins to see why, despite this, it was in response to Kaplan that Carnap decided to set out his conception of values more systematically (last chapter of the Schilpp volume). 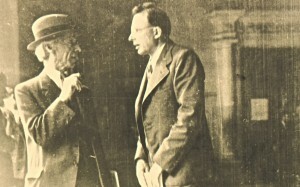 The actual substance of the philosophical tensions between Carnap and Russell — as opposed to the difference in style — is more elusive, but Chris Pincock in the Cambridge Companion to Carnap makes a very good beginning. It’s an interesting case; Carnap probably identified more with Russell than with any other living philosopher, but differed from him quite fundamentally in philosophical doctrine. In retrospect, Carnap is — correctly, I would say — seen as closer to the neo-Kantian tradition and to Frege than to Russell and British empiricism, but he himself would not have been very happy with that. The papers at Georg Schiemer’s “Carnap on Logic” meeting in Munich a couple of summers ago are eventually going to appear as a special issue of Synthese. Actually, they are already in the process of appearing, as they dribble in to the Synthese “online early” list one by one. The first one I’ve encountered is Peter Olen’s close study of the Iowa school’s (i.e. Bergmann’s, Hall’s, Sellars’s) reception — or rather mis-reception — of Carnap’s semantic works in the early 1940s. Perhaps I was not listening carefully enough when he gave the talk in Munich, but I have to say the published version strikes me as much more lucid and compelling. He documents in elaborate detail just what Bergmann and Hall (and then Sellars, as a result) got wrong, and why Carnap, despite some effort, was unable to set them straight. I hope people notice, because the misunderstanding in question has propagated itself pretty aggressively. If Fraser MacBride is to be believed, it was Bergmann’s student Herbert Hochberg who is to be held responsible for the “ontological turn” in analytic philosophy (not Quine, as Huw Price and others have made adequately clear) — and, it seems, largely on the basis of this very misunderstanding! Hochberg apparently had some influence on Armstrong, and thus perhaps at least indirectly also on Chalmers. So the misunderstanding Olen focusses on so minutely is worthy of the attention — it has a lot to answer for, and may even be partly responsible for our current efflorescence of metaontology and analytic metaphysics more generally. I have to confess I have a personal axe to grind, as I wrote something on Sellars’s reception of Carnap a while ago, and no one paid much attention at the time. I argued there that Sellars’s early notion of a “pure pragmatics” (including the “material rules of inference” beloved of Brandom) derived from a misunderstanding of Carnap. Now Olen not only vindicates (part of) that claim, but shows in convincing detail where that misunderstanding came from and how Sellars arrived at it. Without that context, I have to admit, the misunderstanding seemed pretty outlandish and my appraisal of Sellars was therefore perhaps unduly harsh (which is no doubt why the Sellars-Gemeinde paid no attention).